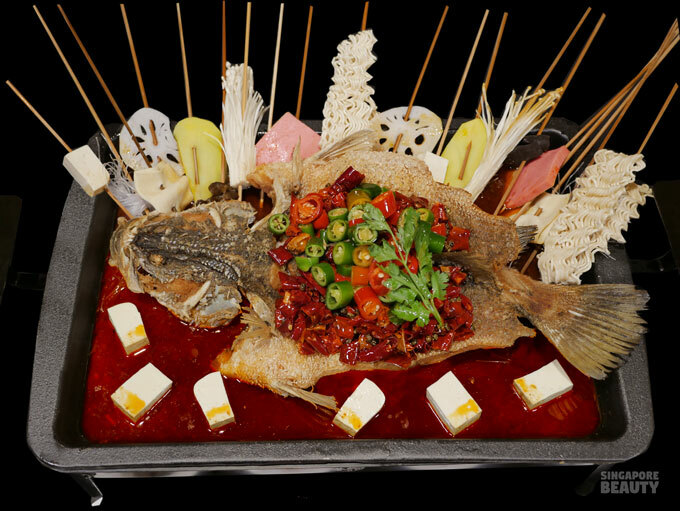 Orchid Roast Fish has launched a whole new selection of seafood to the very popular roast fish buffet. 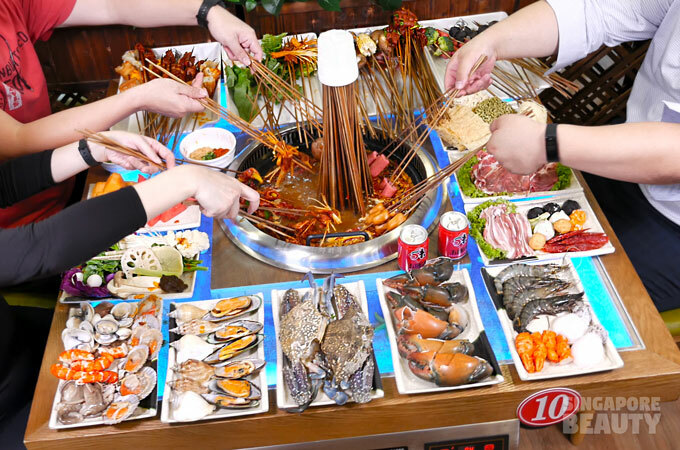 Included in the roast fish + seafood buffet are unlimited serving of roast fish (sea bass), 14 types of free-flow seafood, unlimited sides (shabu meat and greens) and appetisers. 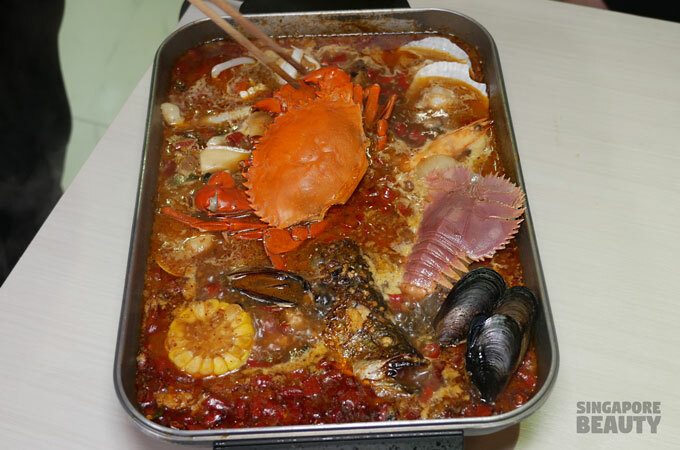 According to the chef, only live mud crabs are used to ensure the texture of the crab is at its best. 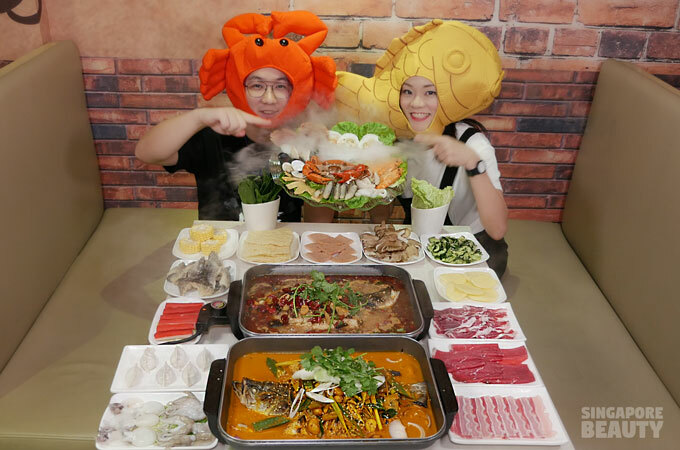 The other type of seafoods available are bamboo clams, abalone slices (mock), squid rings, sea cucumber, mussels, slipper lobsters, sea snail, prawns, white Venus clams, flower clams, squid, cuttlefish and half shell scallops. How about some baby octopus and cuttle fish? 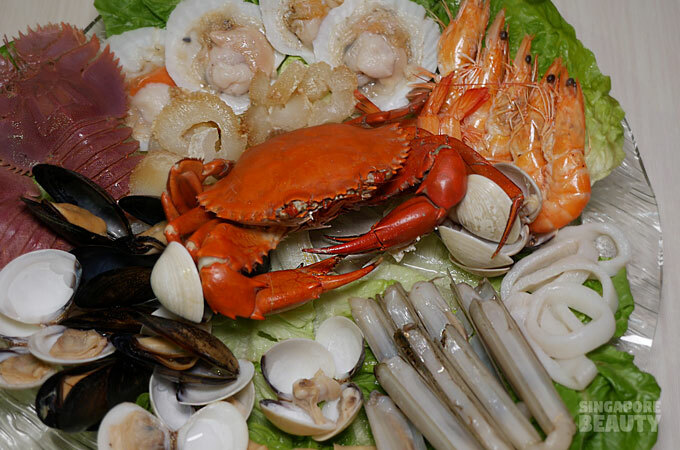 These seafood are included in the buffet and you may eat your favourite type of seafood to your heart’s content at only $36.80+/per pax. 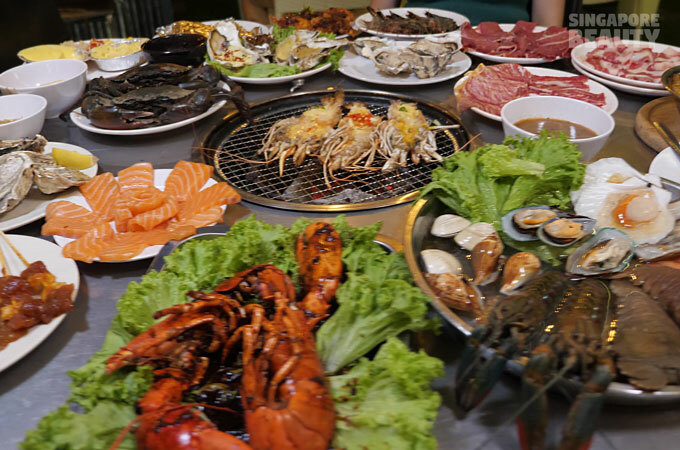 Without the seafood starts from only $18.80+/pax ! 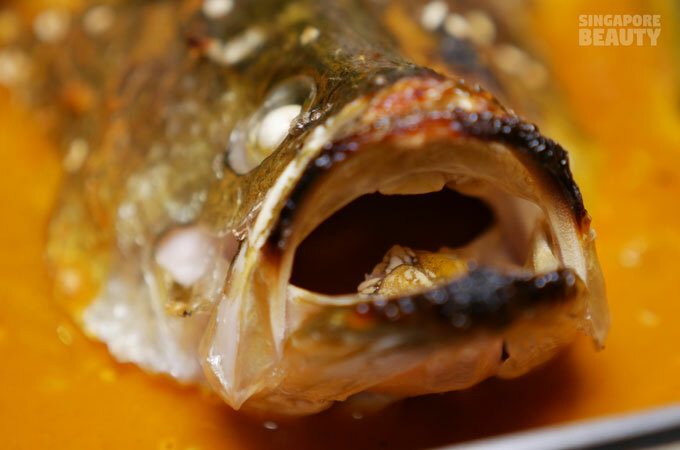 This is how it works – you order your choice of roast fish (sea bass) and the type of gravy to go with it. 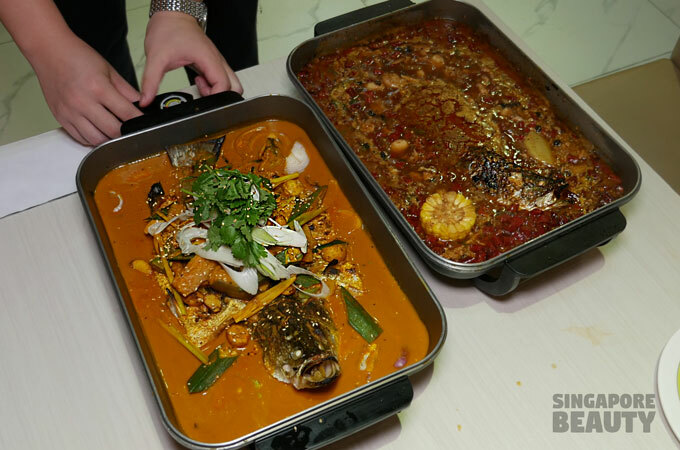 We ate the chef recommended – roast fish in fragrant spices with medium level of spiciness. 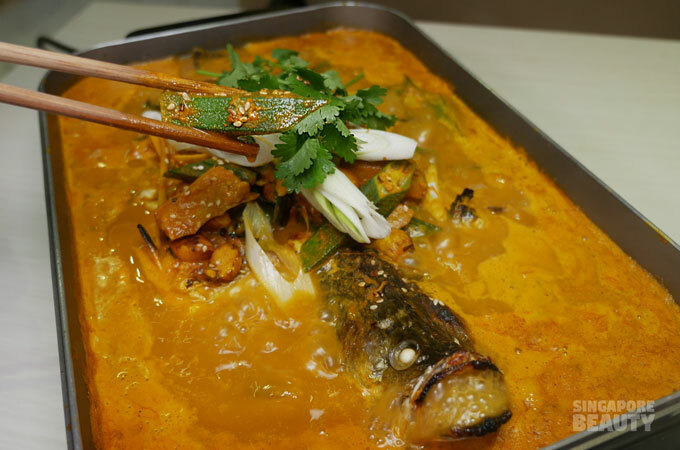 This roast fish has the perfect balance of spiciness and savoury. 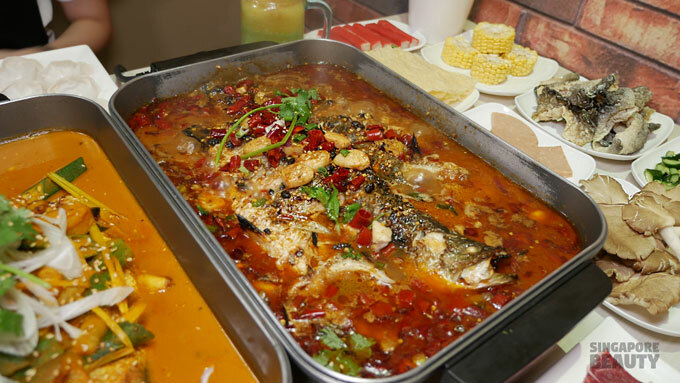 Roasted fish with tender, sweet and juicy flesh. 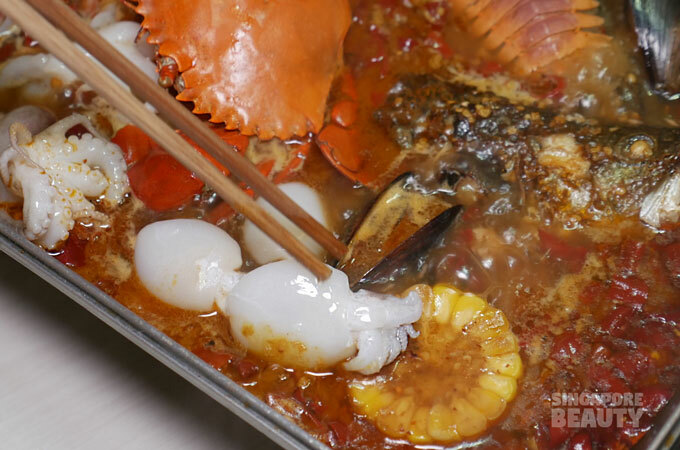 The flesh is infused with the flavourful broth. 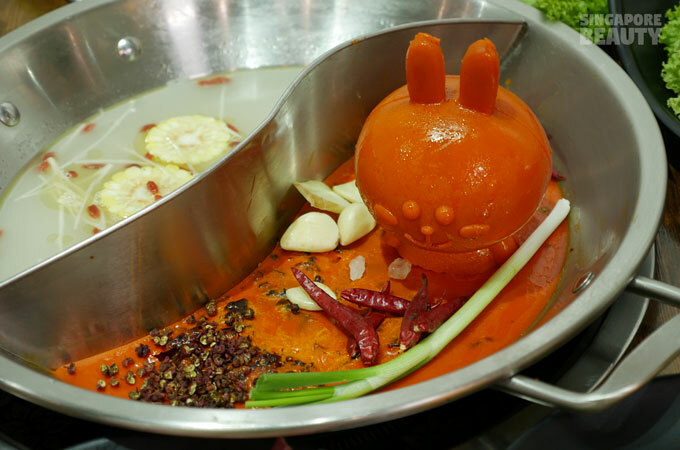 Every mouthful is well balanced with heat and aroma of the spices used. 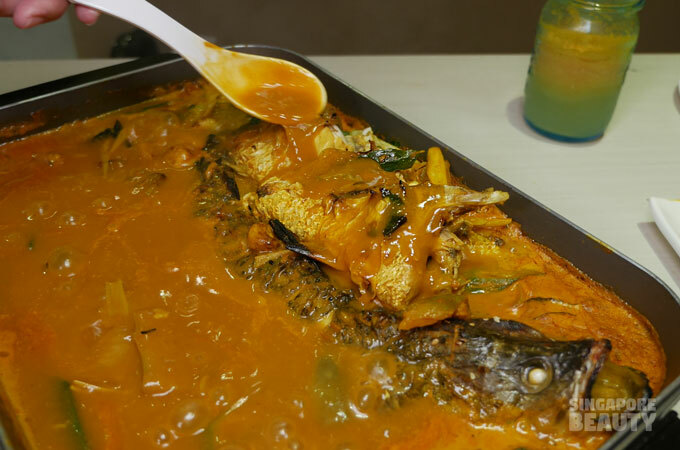 While the roast fish is bubbling away, add the sides to soak up the savoury gravy. These plump dumplings are flavourful bite size minced meat wrapped in a thin pastry skin. 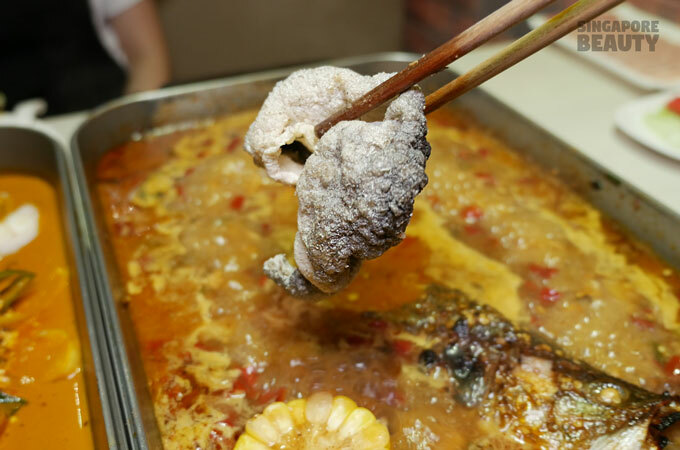 The light and crispy fish skin goes well with the gravy. Dip them lightly to enjoy the crunch of the skin with the gravy. Add the sides, greens and surimi last as these cooks quickly. 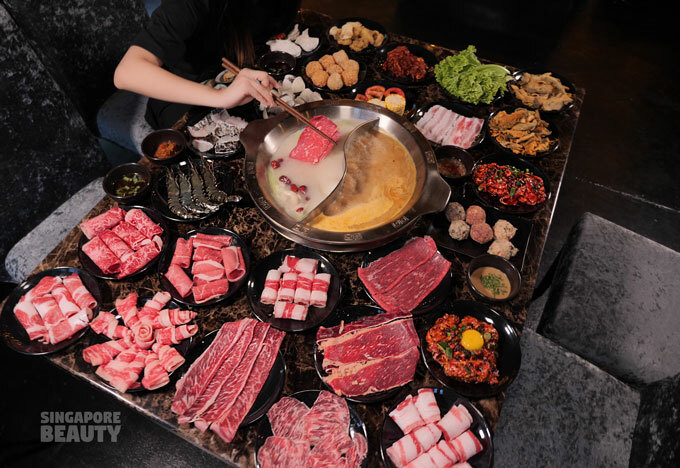 The sides available are romaine lettuce, oyster mushrooms, rice cake, fried tofu skin, tofu skin, kelp, lotus root slices, Chinese cabbages, potato slices, potato noodle, bean curd, winter melon, radish, bean sprouts, spinach, iced tofu, corn yam, mushroom, baby cabbage, enoki and black fungus. 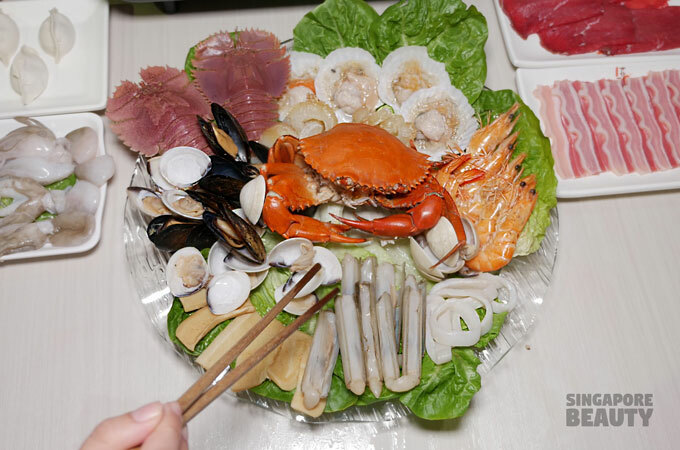 Surimi available are cheese fish tofu, lobster balls, prawn fish ball, octopus balls, sausage, crab sticks, sea urchin balls and fish ball with roe. Thirsty for more? 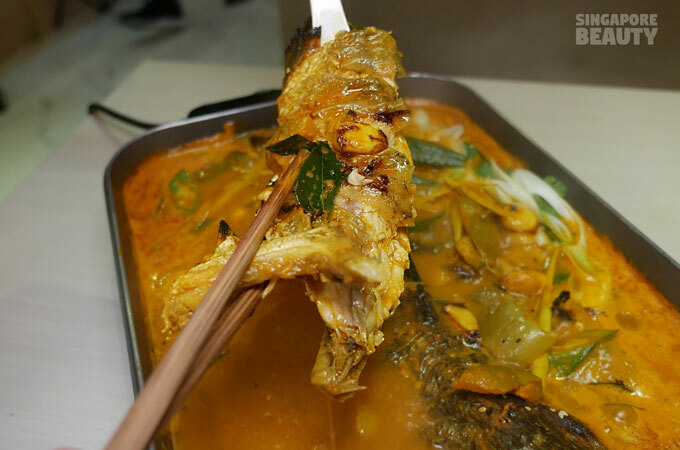 Try the local favourites – curry roast fish. 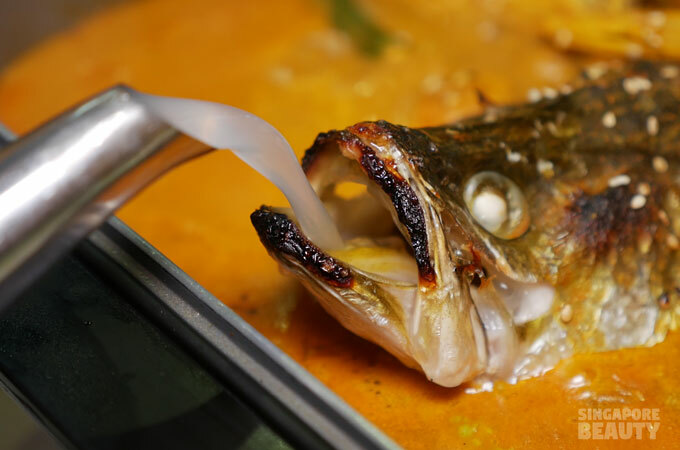 This roasted sea bass is simmered in a luxurious thick curry gravy. 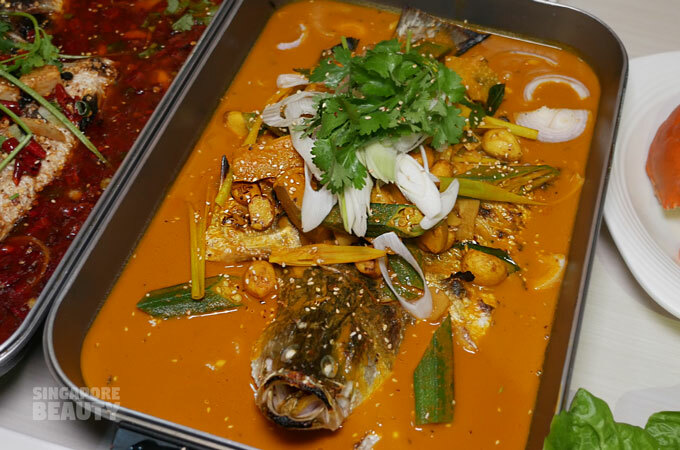 Curry fish are freshly prepared in house by frying several spices such as garlic, chilli pepper, onion, lemon grass and ginger, curry powder and some other spices. 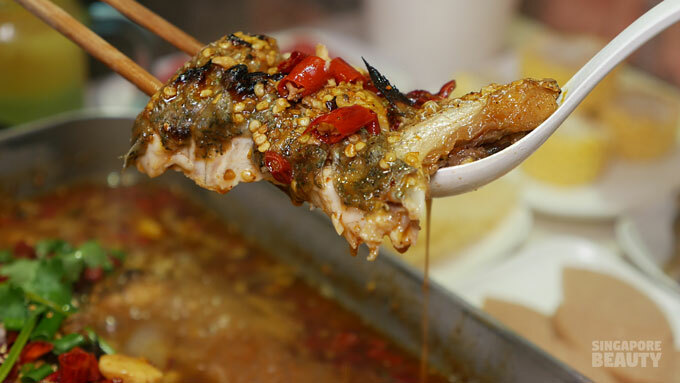 You can smell the aromatic spices and herbs when this is served at your table. After which greens (okra, egg plant, leeks) and seasoning are added to simmer with the roast fish. Meltingly tender egg plant soaking up the gravy and packed with intense flavours. The gravy is thick and packed with flavours, not the watered down type of curry. This is the type of curry you would like to drizzle over a bowl of hot steaming rice. 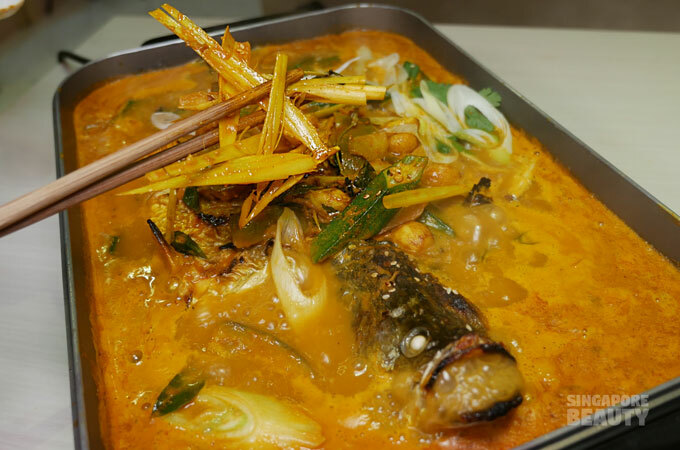 The butterflied sea bass flesh is infused with the goodness of the curry. 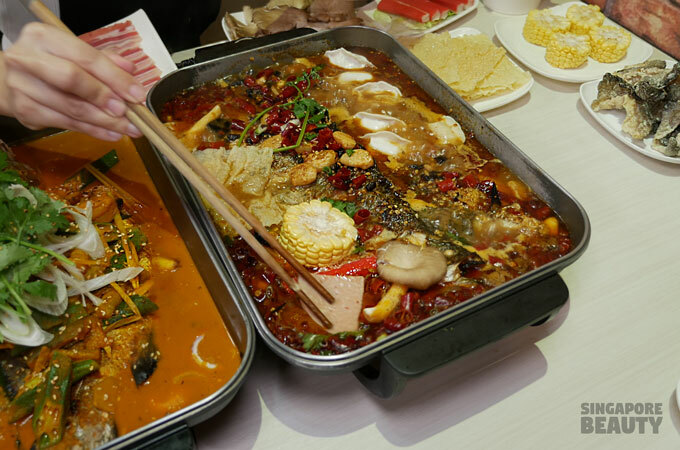 The curry is great for shabu meat such as lamb, beef and pork belly (included in buffet). 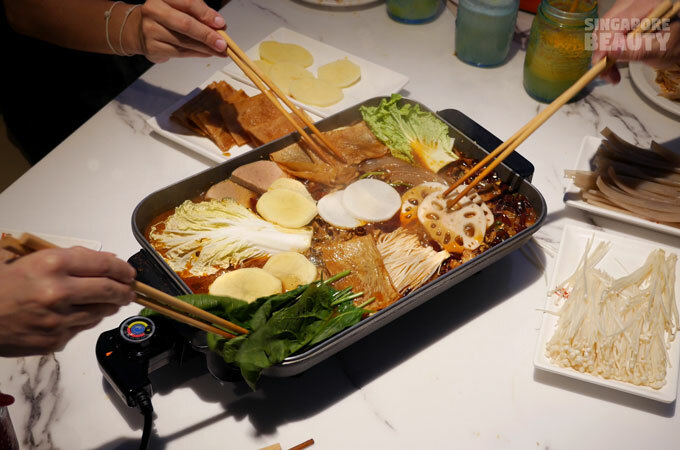 The curry coats each slice of shabu meat with a delicious glaze. 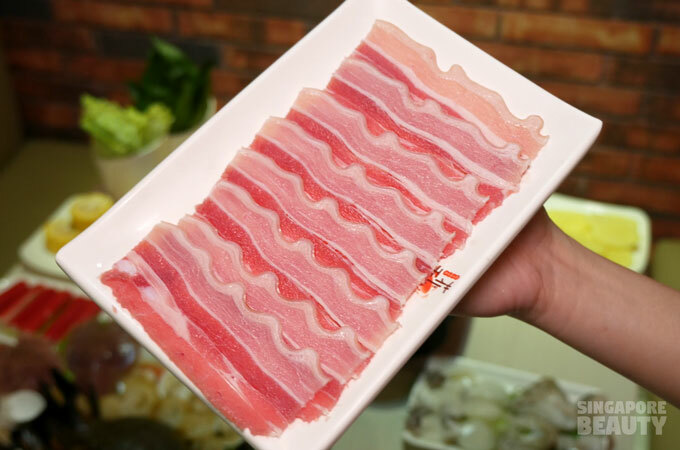 Ribbons of pork belly curl when cooked. 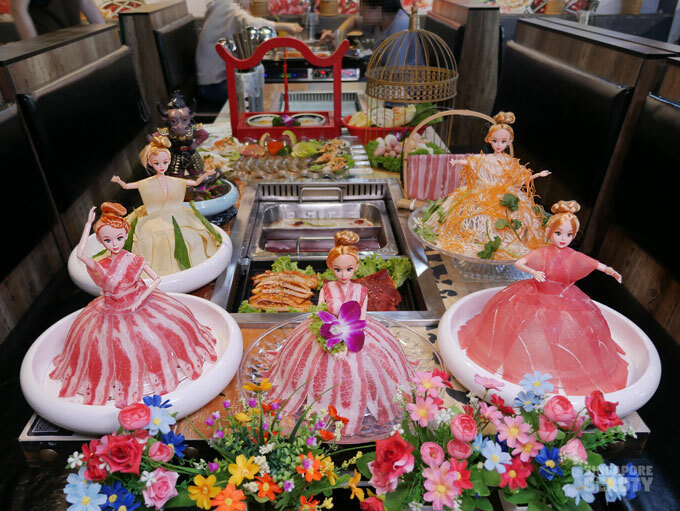 It has alternating layers of gelatine like fats and bites of lean meat, a good balance of fats and meat. 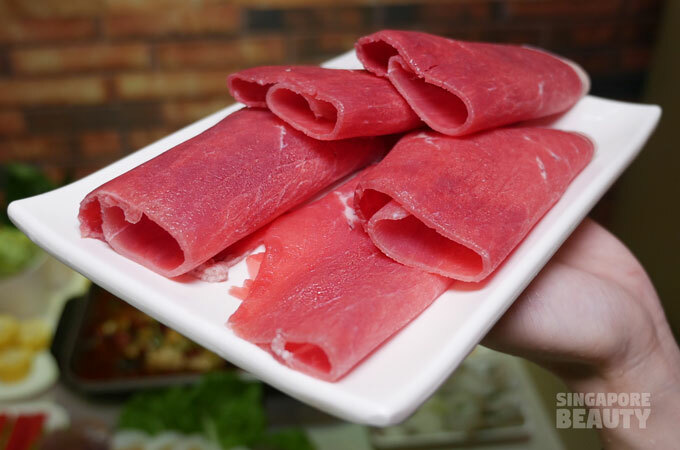 By the way, if you are fans of curried shabu lamb and beef slices, these are free-flow too. 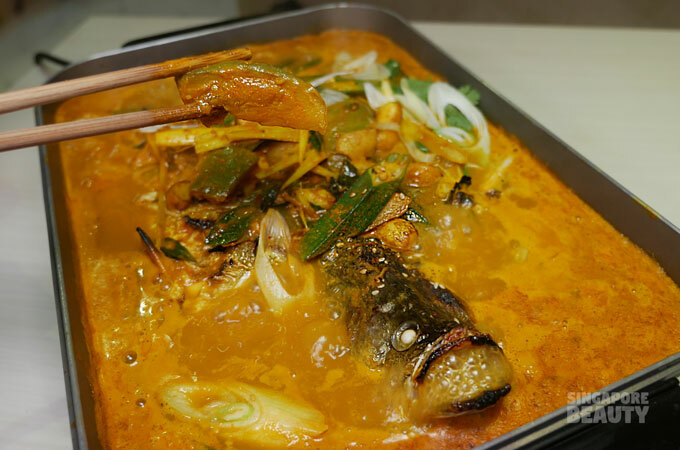 For those who are new to Orchid Roast Fish, the second serving and subsequent orders of roasted fish are all freshly prepared with new broth. 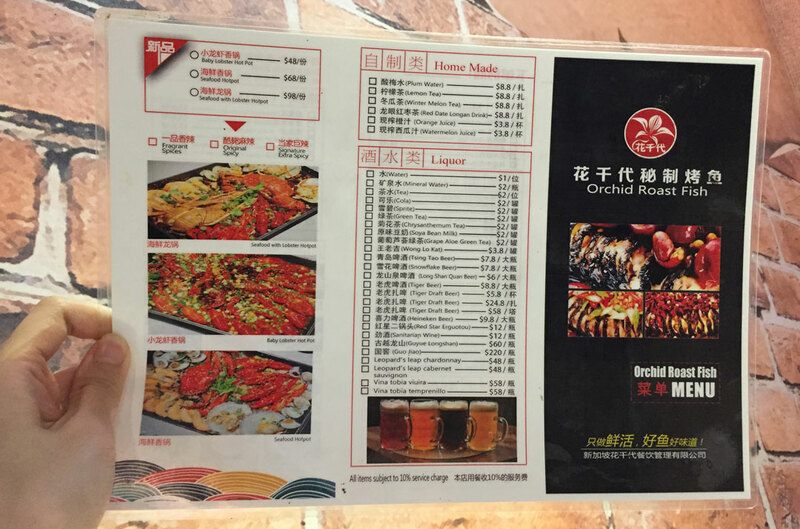 All drinks are on the ala carte menu and starts from $3.80+. 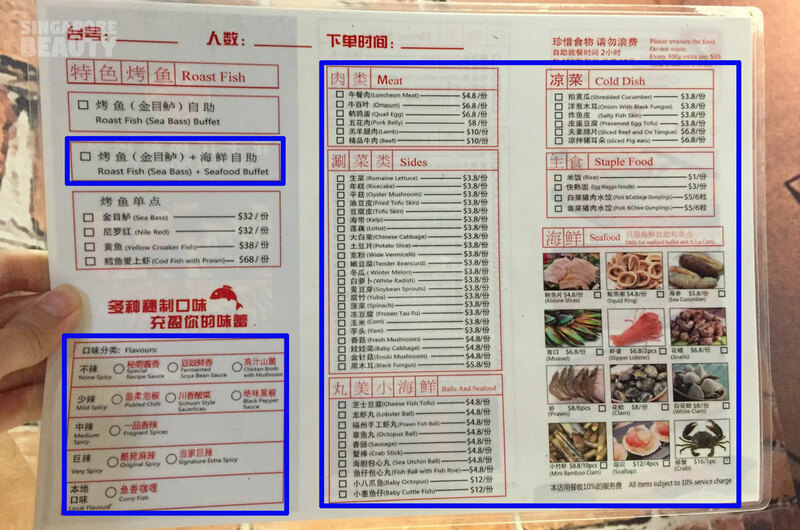 They have homemade plum water, lemon tea, winter melon tea, red date longan drink, orange juice and watermelon juice. Beers and can drinks are also available. 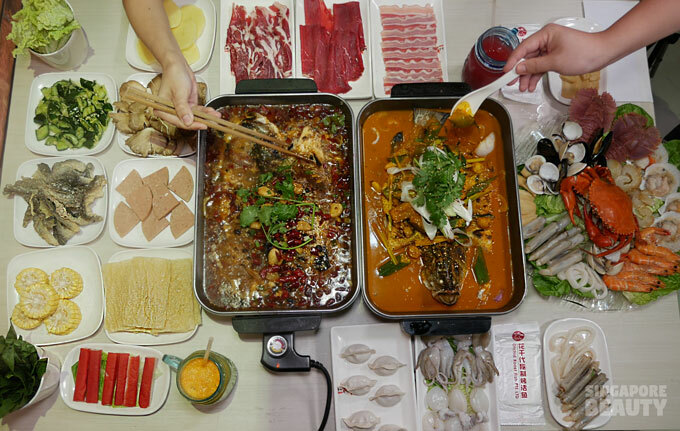 Head down to Orchid Roast Fish（花千代秘制烤鱼）restaurant today. 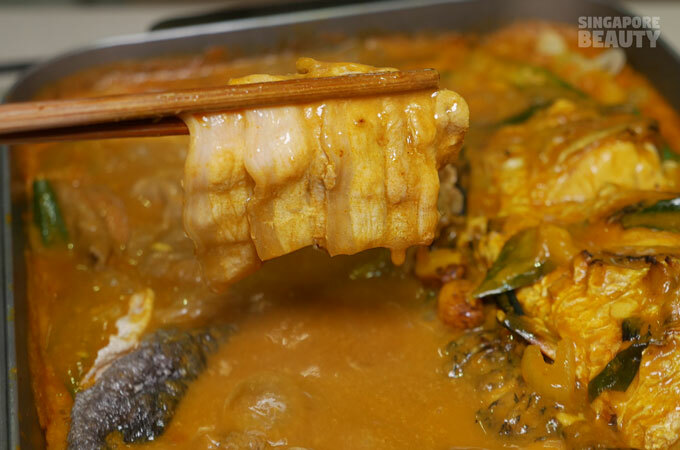 A feast of unlimited servings of roast fish+ curry fish+ seafood + meat buffet is waiting for you at Orchid Roast Fish for a limited time only. 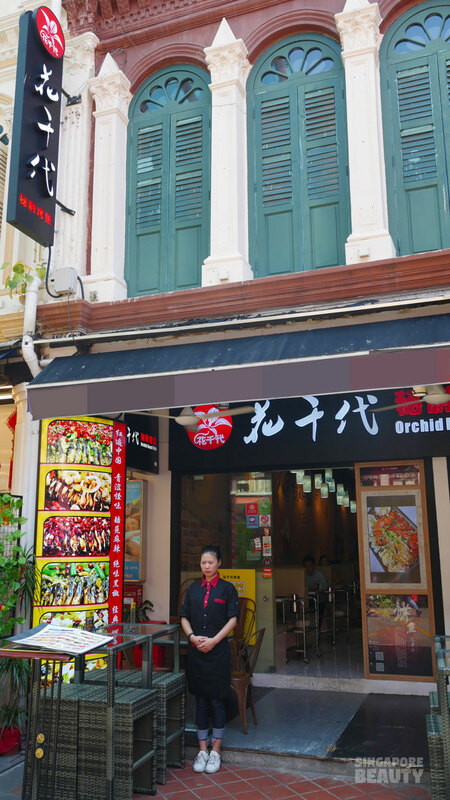 Orchid Roast Fish restaurant is housed in a 3 storey conservation shophouse and is a hidden gem in Chinatown, right next to Chinatown MRT Exit A.